Business is, even without unforeseen mishaps, a complicated affair. The nature of this complication becomes all the more intense when businesses scale up, or start offering services and solutions which have an impact on the livelihood, safety and security of others. 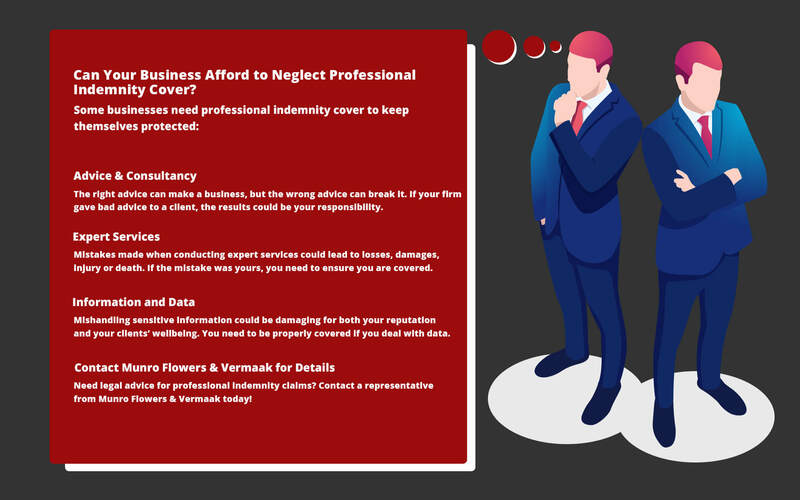 When mistakes in these types of industries arise, businesses can be put under immense pressure from personal indemnity claims, which makes having the right kind of cover and legal expertise on hand a crucial affair for them. But some businesses have a greater need for this than others. So if you operate in any industries that offer the following types of services, you should ensure that you are prepared in the event that claims are made against you. Whenever expert advice is given to a client (such is done in the financial and business consultancy sectors), there is always a risk of such advice having adverse results for the client. When expertly given advice leads to substantial losses, clients may seek to make claims against you for compensation of losses incurred due to any mistakes on your part. When providing expert services, any errors in designs or calculations may result in incurred losses for your client. Your design may have oversites that render the solution dangerous, and when injuries are sustained as a result, your firm may be held liable by the client. Information of a sensitive nature should always be adequately protected from loss, harm or infiltration by a third party. It should also always be used with a certain level of trust (for example it shouldn’t be sold off to a third-party for lead generation). If your business is mistakenly (or purposefully) at fault when mishandling the information of your clients, you may be held liable for it. Highly specialised and risky industries often require that businesses cover themselves against professional indemnity claims as part of their expected compliance to industry standards. These may include IT consulting, accounting, architecture, engineering, risk management and more. In such cases either your clients or a regulatory body may insist that you are properly covered before even conducting business. If you would like advice or information on personal indemnity claims¸ or would like to benefit from our experienced team of legal professionals, be sure to get into contact with a representative from Munro Flowers & Vermaak Attorneys today, or visit our website for additional information.